Some interesting points at the end in the Comments section. I have met so many people who say, as one readers does, that their parents wanted nothing to do with their past after the war. That sentiment echoes with me – my mother felt the same way. That’s how Sergio Carmona, reporting in the Sun Sentinel, described the US Holocaust Memorial Museum’s recent presentations in South Florida. And I am still hoping that someone will eventually contact me to say they once knew Joseph Rosner or his wife Sarah. The organizers of the Shaol & Louis Pozez Memorial Lectureship Series, offered by the Arizona Center for Judaic Studies at the University of Arizona, were kind enough to invite me. The event, held at the Tucson Jewish Community Center on March 6, was covered by the Arizona Jewish Post with a lovely article. “This was more than a quest for justice for mere bricks and mortar, it was to discover and preserve my lost family history,” she said. 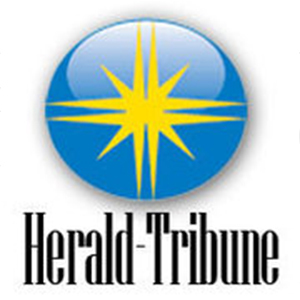 Sarasota Herald Tribune staff writer, Elizabeth Djinis, came to the United States Holocaust Memorial Museum event at Temple Beth Sholom and here’s her report. Gold spoke as part of an event held by the United States Holocaust Memorial Museum in Washington, D.C., moderated by the museum’s director of visiting scholar programs, Suzanne Brown-Fleming, and featuring the museum’s chief of research and reference, Diane Afoumado. Before the lecture, Afoumado also led private sessions with local survivors and those interested in learning their family’s history, using some of the museum’s research tools. One of those is the International Tracing Service, a paper archive formerly only accessed in Germany that can be found in digitized records at the Holocaust Museum. The private sessions for those keen to research, as I have done, the fate of family members were of immense interest to the audience. Many were intrigued by what documents they might be able to unearth with the US Holocaust Memorial Museum’s help. This is a wonderful, free, service but, as I warned people at the event, you have to prepare yourself emotionally for what you might discover. The Jewish Book Council today published a review by Philip K. Jason, professor emeritus of English at the United States Naval Academy. Ever-expanding electronic databases allow skilled investigators access to materials that would never otherwise be discovered or accessed. The chain of discoveries seems endless; absolute closure seems an illusion. Nonetheless, this book is a grand example of dogged investigative journalism. Gold is never satisfied, and she never backs off.